“So this week I have mainly been in rehearsals with Ontroerend Goed, the experimental Belgian theatre company, for their new show All That is Wrong. In the rehearsal room, conversation ranges from the horror of child beauty pageants (see http://www.youtube.com/watch?v=l9nbhzKaqvA for conclusive proof) to the difficulty of choosing what to boycott: meat, Starbucks or religion – or all three. “The vibe has been relaxed and indeed very positive for a show that is ostensibly about all the terrible things that the planet we live on has wrong with it. It centres around Koba, a (remarkably poised) 18 year old Belgian girl and everything she believes to be wrong with the world. 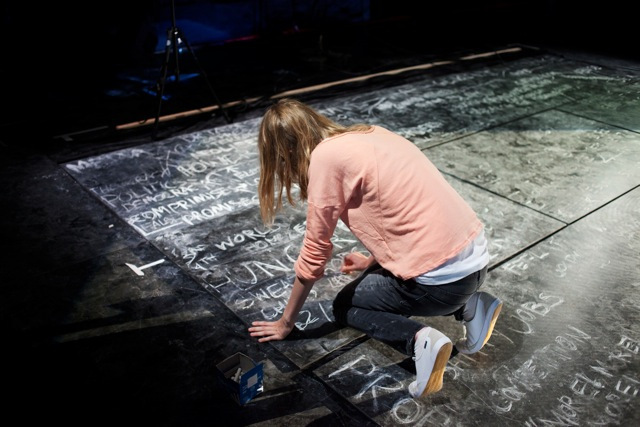 The show is also about writing, as she chooses to communicate with her audience mainly through words, phrases and quotes chalked on blackboards. Every word is carefully considered and given a precise place – Alexander, the director, Joeri, the dramaturg, and the actors Koba and Zach constantly debate the turn of phrase of the many sentences on the board, bringing me in for a ‘native’ British opinion. “Zach’s role is to facilitate Koba’s communication to the audience: he lights her, films the boards so that we see the words more clearly, plays music to help the rhythm of her writing. But it is Koba’s thoughts, those she chooses to commit to chalk anyway, that are the main focus. Writing, looked at in this way, really becomes quite hypnotising – even though I have seen some sections played again and again until they are perfectly choreographed, I’m still compelled to watch the simple yet evocative sweep of chalk on a blackboard, in a way I couldn’t conceive of beforehand. “What is exciting about being in OG’s rehearsal room is that they are constantly evolving and reacting: as events occur in the real world, so they enter Koba’s world and become part of ‘all that is wrong’. As we were rehearsing in the week of the Batman shootings in Denver, this inevitably became a talking point and ended up on Koba’s ever increasing chalk map of all that is wrong. When asked about his greatest fear, Zach came up with baldness, so that too made it on the map. “However, perhaps a show with the title All That is Wrong was tempting fate a little too much. As opening night arrived, the performers were building themselves up to playing to a sold out crowd when it appeared that the paint on the blackboards was not yet dry. And despite the baking temperatures in Plymouth this week, they refused to dry in time: the show could not go on. “So that is perhaps another thing that may be added to the list of things that are wrong: paint that refuses to dry in time for your opening night. As the show goes on the following night though, the house is full again and all goes rather right actually”. All That Is Wrong is at the Drum Theatre Plymouth until Saturday 28th July ahead of a run at the Traverse for the Edinburgh Fesitival.